At Target Field’s Majestic Twins Clubhouse Store, you’ll find the authentic jerseys of Justin Morneau, Joe Mauer, Josh Willingham, Ryan Doumit, Trevor Plouffe and current Rochester Redwings Chris Parmelee and Tsuyoshi Nishioka on sale for $325. Noticeably absent is Denard Span. When I pointed this to an employee he shrugged and seemed as puzzled as I was. So far this season, Span has arguably been the team’s best player, hitting .292 with a .358 on-base-percentage and 4 steals. He covers a lot of ground in centerfield and plays with a fire and passion that some of his more heralded teammates lack. Because of that and his relatively modest contract, he’s likely to be traded by season’s end. With Mauer’s contract and Morneau’s health issues, Span is one of the few Twins with any value on the open market. The 28-year-old took some time out to talk with me following batting practice during the last homestand. DZ: I’ve got some hard-hitting stuff right away; have you been watching the NBA playoffs and what do you think so far? SPAN: I’ve been paying attention a little bit, not as close in the first round. The first round gets kinda boring; you kinda know who is going to win for the most part. The second round is about to start heating up. Boston looks tough; Miami is the team I am rooting for. Boston is going to give Miami a little problem, but I am hoping it’s Miami and OKC. DZ: Have you met Lebron or D-Wade at all? SPAN: No, I have never met those guys. DZ: Onto the Twins stuff. Obviously the team isn’t playing the way you guys would like to – I know you’re a guy who hates losing – what’s it been like for you so far? SPAN: It’s been tough, man. We went through this last year, but the majority of the time I felt disassociated with the team because I was hurt and dealing with my own problems at the time…it’s still early in the season, I am still confident we can turn it around. So far it’s been tough, but we are a better team than we’ve showed. DZ: It’s your 5th year now, you are a veteran, have you stepped up to be a leader and taken on that role now? SPAN: Yeah, somewhat I have. By nature I am not a vocal person. I’ve never been the type of person that will just talk just to be talking. Whenever I say something, I want it to be profound, I want people to listen because I want people to know that when I do say something, it’s meaningful. I try to open my mouth when it’s the right time. DZ: Last year you had the concussion, missed a lot of time. Obviously, that’s frustrating, what did you learn that? What do you know now that you didn’t know a year ago? SPAN: I learned how lucky and blessed I am just to be in the position I am playing this great game. I believe I was a humble person before the injury, but it definitely humbled me more and made me appreciate the smaller things of waking up every day, feeling good like I feel now. It made me just appreciate being healthy and doing what I love to do. DZ: Your first three or four years here it was pretty stable in the outfield – Cuddyer, Delmon – this year it’s a whole different ball game. What’s that been like for you? SPAN: It’s been a little different trying to get used to the different guys next to me, but it’s nothing I can control. They are great guys that have been put out there, so I am just trying to do the best I can to help those guys out and help the team out, really. DZ: Every year you do a (charity) bowling tournament, what’s your bowling average? SPAN: Actually, I don’t have one because I don’t even bowl at my event. DZ: You don’t bowl at your event?! SPAN: I am being Mr. PR guy. I am walking around, shaking hands and thanking everybody for coming out and showing their support. DZ: I noticed have a Delmon Young bat there (used for batting practice), what’s the story behind that? SPAN: I weigh probably about 205, Delmon probably anywhere from 210 to 250 (laughs), so he’s a little bit bigger and stronger than I am and so he swings a bigger bat than I do. So, for BP and pregame, I like to swing his bat so when game time comes and I pick up my bat, my bat feels light. 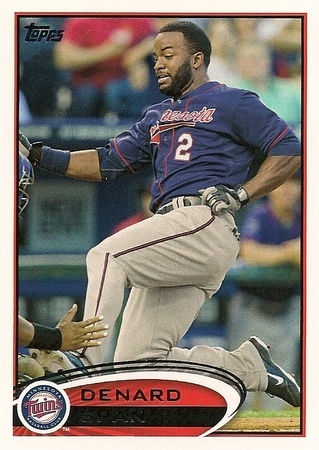 This entry was posted on Thursday, May 17th, 2012 at 6:18 pm	and is filed under MLB, Twins. You can follow any responses to this entry through the RSS 2.0 feed. You can leave a response, or trackback from your own site.